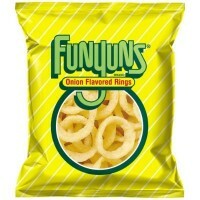 Crunch into the savory onion snack that’ll speak to your inner 90s kid. 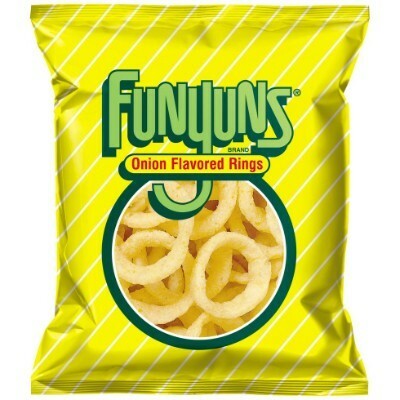 Funyuns combines the crunch of a chip with the unique flavor of onion rings! The individual bag packaging makes this crunchy and satisfying treat the perfect savory accompaniment to the rest of your road trip snacks or lunch boxes! Enriched corn meal (corn meal, ferrous sulfate (iron), vitamins B3-B1-B2-B9), vegetable oil (sunflower, corn and/or canola oil), salt, less than 2% of: corn starch, sugar, corn flour, buttermilk (milk), maltodextrin from corn, onion powder, flavor enhancer E621, hydrolyzed corn protein, dextrose, garlic powder, natural flavors (including natural toasted onion flavor), thickening agent E414. Contains GMO. Nutrition facts (for 100g): calories 464Kcal, total fat 21.4g (saturated fat 3.6g), total carbohydrate 57.1g (sugar 3.6g), protein 7.1g, salt 2.5g.